MANCHESTER — On August 24, 2012 three Mercedes Sprinter Ambulances arrived from American Emergency Vehicles in North Carolina. The three additional, unmarked ambulances will be added to the two already being held on-site as ASM. Four of these will soon be sent out to receive the high-visibility Aetna/ASM Battenburg markings, rear chevrons and company logos. The Mercedes Sprinters will replace several aging Ford models, leaving the fleet with only four Fords at ASM and seven at Aetna as of this writing. 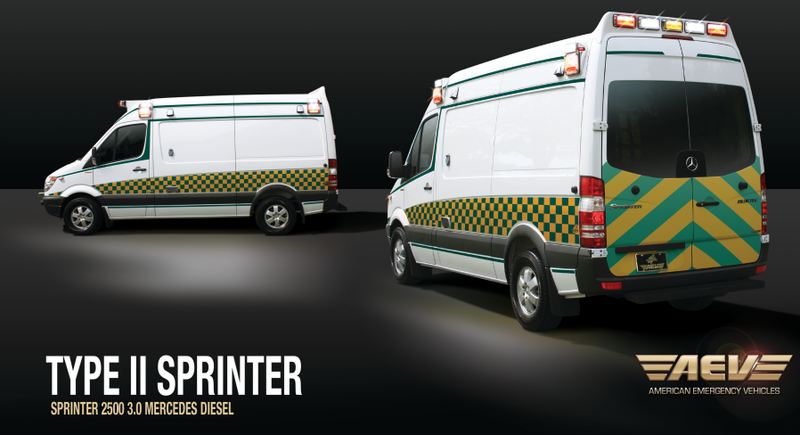 HARTFORD — Aetna’s distinct half Battenburg featured on the Dodge version of our Sprinters was used in an American Emergency Vehicle brochure for their Mercedes version. 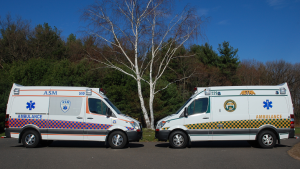 Aetna began taking delivery of AEV Dodge Sprinter ambulances in 2009 and Mercedes Sprinter ambulances in 2011. Only a handful of Ford ambulances remain in both fleets. MANCHESTER and HARTFORD — Aetna and ASM send Patient and Customer Satisfaction Surveys to a random sampling of patients who have received emergency or STAT inter-facility services from our companies. The final question in the survey asks “Do you have any suggestions on how we can improve our service. EMS is often a thankless field. We feel that expressions of appreciation deserve to be shared and constructive comments deserve to be acted upon. An effort is made to share positive and/or constructive comments with the field staff and with the public we serve. Some of the other responses we have received are highlighted throughout our blog and on our website. If we have treated you and you would like to request a blank survey please call our office at (860) 647-9798 or send your comments to us at PO Box 300, Manchester, CT 06045-0300. Or, simply click the Leave a Reply link below. MANCHESTER– On August 15, 2012, four EMTs were added to the ASM team. As part of our continued growth ASM and Aetna seek out only the best candidates. We look for employees who are focused on high-quality patient care, are team oriented and conduct themselves in a professional manner. During the orientation, employees learn about company philosophy and goals, quality assurance, and policies and procedures. Nicole Geier: I am 27 years old and I reside in Windsor, Connecticut with my husband Chris, our dog, Bender and our cat, Fry. I am currently enrolled in the Goodwin College Nursing Program and I will become a Registered Nurse in May 2014. With the Bachelor’s degree I already have in Criminal Justice; I hope to become an RN in a correctional facility. I spend most of my time volunteering at the Windsor Fire Department as a Firefighter/EMT as well as volunteering at the Windsor Volunteer Ambulance, where I completed my EMT certification class this past May. I enjoy listening to music, playing the guitar and piano, watching TV and hanging out with family and friends. I love Diet Coke, the Red Sox and anything related to zombies (movies, books, video games – you name it!). I am looking forward to beginning my new career within the EMS field at ASM. Michael Hoyt: I am 36 years old and live in Bolton with my girlfriend, Stephanie. I became interested in EMS while exploring a career change to nursing. I spent ten years working with people with disabilities throughout the state. After spending too much time at a desk, I wanted something more direct, more hands-on. I missed the personal connection to those I was serving. Since my first exposure to patient care, I’ve been hooked. I received my EMT certification in January from ASM and plan to study for my Paramedic license sometime in the future. I was impressed by the caliber of people I met while studying at ASM and feel honored to join the family. Outside of work, I enjoy reading and travel. I also enjoy playing with my nephews, building with blocks, playing cars, or perhaps the most pleasurable of all life’s pursuits, Legos. Mikhail A. Khan: Full time EMT. When I was offered a position at ASM, one of the paramedics patted me on the back and welcomed me aboard. It was then I knew I had joined a great team. Anybody can kick a football but only a focused, coordinated team can win a championship. Having traveled extensively, I have lived on three continents and am fluent in three languages and conversant in a few more. I spent many years in South Asia and East Africa and have traveled in Europe. Listening to Pink Floyd and U2 while hiking in the Himalayas and to Led Zeppelin and Queen during safaris, I am a huge music buff. My educational background is wide ranging, studying in an American Embassy School as well as strict Catholic schools. This exposure to different cultures has taught me that there are far more similarities than differences among people. I am an avid swimmer and an outdoor enthusiast. My interest in EMS was sparked when I was only nine years old at a swimming pool. The lifeless body of a little boy had been pulled out of the deep end of the pool. There was pandemonium; the child’s family was hysterical while onlookers watched. My father, who had been trained in first aid, immediately took action and performed CPR on the boy who started to breathe. I will never forget how quickly his skin changed from ashen-blue to pink. It was then that I realized that EMS is a field where one can make a difference. After many years, I entered the banking industry, living my life in a metaphorical and literal cubical. Once I completed the EMT program at Hartford Hospital and started volunteering extensively at a volunteer ambulance, I was professionally and personally invigorated. I have had the opportunity to work with some very talented paramedics and EMTs and aspire to become a paramedic in the near future by furthering my education in this area. I have come to learn that perseverance commands success. Billy Schnepp: My name is Billy Schnepp. I am 22 years old and from Suffield, CT. I’ve been an EMT since high school and have been hooked ever since. I recently graduated from the University of Connecticut with a Bachelor’s in Psychology with a focus on neuroscience. In college, I volunteered as a clinical interpreter at a primary care office in Willimantic to help bridge the gap between Spanish-speaking patients and English-speaking providers. In my down-time, I enjoy swimming, reading, spending time with friends, and browsing clinical research. I am fascinated by the human body and am looking to pursue nursing school. I would ultimately like to become a physician or clinical psychologist. I’m always looking to further strengthen my skills in EMS, as well as obtain enrichment in all aspects of emergency care. I am looking forward to joining the ASM team. HARTFORD– On August 9, 2012, six EMTs and three Paramedics were added to the Aetna team. As part of our continued growth Aetna and ASM seek out only the best candidates. We look for employees who are focused on high-quality patient care, are team oriented and conduct themselves in a professional manner. During the orientation, employees learn about company philosophy and goals, quality assurance, and policies and procedures. Laura Adamowich: Part time EMT. My name is Laura Adamowich and I’m 23 years old. 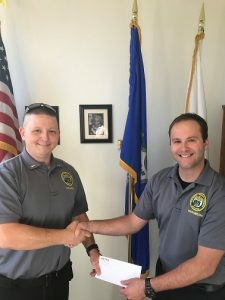 I first started my EMT class a little over a year ago, the day after I moved back to my hometown of Bristol, Connecticut from Virginia, where I had graduated from Liberty University with my Bachelor’s in History. I’ve been volunteering as an EMT since last fall when I received my certification and look forward to starting my career in EMS with Aetna. While working, I will also continue pursuing my Master’s degree part-time online through Northeastern University. When I’m not working or studying, I enjoy reading, gardening, music, photography and media, and exploring the rich history that Connecticut has to offer. I’m excited about the future I have ahead of me at Aetna, and look forward to continuing to learn and grow as an EMT! Jeff D’Albero: Full time Paramedic. My name is Jeffrey D’Albero, I am 25 years old. I live in New London with my fiance Mariaha, and two year old Caleb. I have been involved in fire and EMS since I obtained my EMT when I was 16. I decided to further my education in 2010 when I started the paramedic program at Capitol Community College in Hartford. Upon completion I received my credentials and began working as a paramedic in Bridgeport. I also work as a part time Firefighter for the Town of Waterford. I enjoy SCUBA diving, crossfit, and spending time with friends and family. I am excited to join the Aetna Ambulance team and am looking forward to work. Travis Dixon: Full time EMT. I am a full-time EMT and am 33 years old. After a year of college at the University of Connecticut majoring in Business Management I enlisted in the US Marine Corps in Infantry. After 9/11 I began working at CCMC in the Human Resource Dept. However in 2003 I was deployed for the invasion of Iraq where I traveled to Okinawa, Japan, Bahrain, Crete, Thailand, Kuwait and various other countries all within a year. When I returned I began working at Hartford Hospital but eventually decided to become self-employed. It was a visit to my mother’s house one day that changed my life. She wasn’t home however my aunt from Florida was staying with her for the summer. I found my aunt on her bedroom floor, suffering from a stroke. It was a Paramedic that first responded. It was that intense event that opened up my eyes to the EMS field. I have a five year old son who LOVES trains and is beginning kindergarten in September. 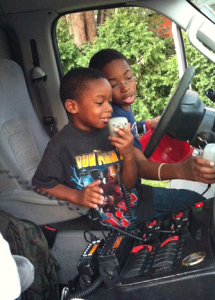 He is excited to see his Daddy on an Ambulance, helping people. Michael Joseph: Full time EMT. Hello, my name is Michael William Edgar Joseph. Yes, I have four first names but I usually only use one or two of them. I graduated from UConn with a chemistry degree in 2009 and have been doing a little bit of everything since. I lived in Spain for a couple years working on farms then came home to work a couple jobs in chemistry and tutoring. My ultimate plan is to go to medical school although I want to get more hands on experience working with patients. Honestly I couldn’t have asked for a better opportunity than to work as an EMT for Aetna. I’m really looking forward to learning all that I can so please feel free to share your wisdom with me. As for interests outside of healthcare, I like languages, traveling, the great outdoors, my dog and making movies with my friends and family. Camillo Quezada: Part-time EMT. My name is Camilo Quezada and I’m 23 years old. I’m fluent in Spanish and enjoy gaming in my spare time. EMS is my passion and to further my career I have enrolled in Medic class inHartford. I have a great girlfriend who also started working inHartfordand we’ve decided to relocate to the area soon. I began researching EMS providers in the area and was immediately impressed by Aetna’s reputation. After meeting with the staff and looking around the campus I knew this was a place I could work for many years and be fulfilled. Looking forward to meeting the team and continuing my education. Angel Rodrigues: Full time EMT. The main reasons why I began a career in EMS is to help others in need, to give back to my community and polish my skills as an EMT-B. I took the EMT course through Hartford Hospital because I’ve heard they’re tough and go in-depth with the material. My mentality is, if you can do it, so can I. And if so, go earn it. I enjoy playing baseball, football, and basketball. I love to go hiking during my days off and swim in the pool. During my down time, I like to sit outside and read. It’s called practicing medicine, and I know that there is no such thing as the “perfect EMT/medic”, but I do want to be on top of the game. Taylor Salva: Full time Paramedic. I’m a new Paramedic. I graduated from Capital Community College in October of last year. I’ve lived in the New London/Groton area all my life, until my wife, daughter, step daughter and I recently moved to Griswold. I enjoy boating, fishing and shooting. I’ve worked as an EMT basic, a firefighter, and ER technician for some time now and am excited to start my paramedic career. Mike Weller: Part time EMT. I’m Michael Weller and I’m 24 years old. For the last five years I have been working as a DJ all over Connecticut and New England. I have been slowly transitioning out of the DJ business to focus more on a career in EMS. I originally got my EMT certification and firearms training in order to become a police officer. After several months in the process of looking for a law enforcement job I started working in EMS and I found I really liked it. For a little over a year I have worked at Cromwell Fire Department and I decided it was a good time to commit to the medical field. I am currently enrolled in Hartford Hospital-Goodwin College’s Paramedic program (expected graduation in December ’12) and I have thought about continuing my education to possibly become a CRNA. I like to snowboard in the winter and mountain bike in the summer and to generally stay as active as possible. I would describe myself as outgoing and easy to get a long with and I look forward to the new people I will meet at Aetna. EAST RUTHERFORD, NJ — On August 7, 2012, members of Aetna and ASM’s Operations team and the Fleet Service Manager attended a training and demonstration session of the Adaptive Electronic Stability Program. ESP is standard on the Sprinter Ambulances that Aetna Ambulance and ASM operate. The training was held regionally at Giants Stadium in East Rutherford, New Jersey. Operating Mercedes Benz Sprinter Ambulances equipped with Adaptive ESP is part of Aetna and ASM’s long-term commitment to the safety of our patients and EMS crews. 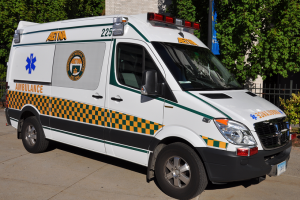 Aetna and ASM are in the process of transitioning to all Sprinters for the regular fleet and currently operate 33 Sprinter Ambulances.